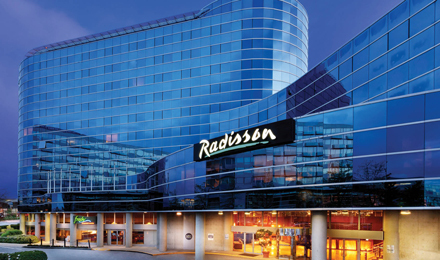 Located less than 10 minutes from the Calgary International Airport (YYC), Radisson Hotel & Conference Centre Calgary Airport is the perfect place for air travellers. Whether you’re attending a conference or meeting clients in Calgary, our location less than 20 minutes from downtown makes corporate travel convenient. Vacationers also appreciate proximity to attractions like The Hangar Flight Museum, Calgary Zoo and CrossIron Mills, less than 10 kilometres from the Radisson. When you’re travelling on business, reserve one of our Business Class Rooms to enjoy an upgraded room, a complimentary breakfast and a free evening drink voucher. The XS Lounge and Grill serves an exquisite array of marbled Canadian steaks, Ocean Wise seafood and vegetarian dishes made from seasonal ingredients. Pair your meal with a glass from our award-winning wine collection, stored in an elegant glass wine cellar. For an elegant setting to gather with friends or colleagues, visit The Wine Bar, also on site. Order an award-winning merlot, and pull up a chair next to the marble-accented fireplace. Calgary Zoo – Less than 20 minutes away, the Calgary Zoo is a fun place to see animals from around the globe. From a butterfly garden and the Canadian Wilds to the African desert and a prehistoric park, the zoo lets you explore a variety of unique animal environments. The Hangar Flight Museum – Founded in 1960, The Hangar Flight Museum houses more than two dozen historical planes and helicopters. You can browse two giant hangars and get an up-close look at the aircraft, just three kilometres from the hotel. Calgary Tower – A 19-minute drive gets you to Calgary Tower, a structure rising 191 metres (626 feet) above the city, providing a stunning 360-degree view of the city. For a special treat, dine at the tower’s rotating restaurant. Choose the Radisson for your next conference to enjoy free high-speed, wireless Internet, audiovisual rentals and a professional staff that can assist you with every detail. Let us take the stress out of wedding planning by hosting your reception in our 4,500-square-foot ballroom. We also offer an all-inclusive wedding package that provides complete setup of tables, linens, china and more. Enjoy peaceful sleep in CalgaryWhether you’ve spent the day in meetings or out exploring Calgary, come home to one of our 120 stylish hotel rooms and enjoy great amenities like free Wi-Fi, an iPod® charging station and a coffeemaker. You can catch your favourite shows on a 42-inch flat-screen HDTV or read the headlines of a free daily newspaper. Need a snack? Store your treats in the mini fridge to enjoy later. Enjoy standard amenities like free Wi-Fi and coffee facilities, as well as your choice of one or two queen beds. These spacious rooms offer king beds and all standard amenities, including a large work desk and premium linens. Have some extra privacy in our One-bedroom Suite, where you’ll rest well on a king bed in a separate bedroom. Convenient dining options near the YYC airportWith the perfect blend of cosmopolitan cooking and premium cuts of meat you’d expect from a prairie city, XS Lounge and Grill serves hearty cuisine that appeals to every palate. Pair your certified Angus beef rib eye with one of our award-winning wines, or order a plate of fish tacos and a goat cheese salad. From the glass wine cellar at the entrance to the final sip of whiskey, you’ll enjoy warm hospitality and tasty fare at our on-site restaurants. Take advantage of our monthly specials, local beers and a wide range of scotch, vodka, gin and whiskey. We make every effort to accommodate the dietary restrictions of any guest. This steak, seafood and chop house features mouth-watering Ocean Wise seafood, premium marbled Canadian steaks, tender ribs, pastas and salads, all expertly prepared by our chefs. Save room for one of our rich desserts! The Wine Bar includes select menu items from XS Lounge and Grill as well as an expansive list of award-winning wines from around the world. Warm yourself by the marble-accented fireplace or watch the game on the big-screen TV as you sip your wine of choice. The room is also available for hosting an event of up to 40 guests with food provided by the on-site restaurant.